e-Vouchers are available to UK and international customers. e-Vouchers will be e-mailed to you within 24 hours of purchase as a .pdf attachment. Please make sure you have mail@piccadillyrecords.com in your contacts to avoid the email being sent to your junk mail. Gift Vouchers are available to UK customers only. They are posted out using Royal Mail Special Delivery which is £6.50. This is a next day signed for service, so someone needs to be available to sign for the delivery. Pick up in-store option is not available for gift vouchers. We will always post the vouchers to the card holder’s address. If you want us to post them direct to the recipient, then please provide their name, address and any greetings you wish us to add to their card in the ‘customer comments’ section of the order page. Please DO NOT put their details in the 'post to' fields on the order page. 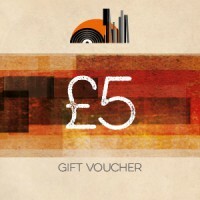 GIFT VOUCHER - UK CUSTOMERS ONLY - £6.50 POSTAGE VIA ROYAL MAIL SPECIAL DELIVERY GUARANTEED. ONLINE E-VOUCHER - UK & INTERNATIONAL CUSTOMERS - E-VOUCHERS ARE EMAILED WITHIN 24 HOURS OF PURCHASE. See Fomat Info for more details. Both types of vouchers can be redeemed either online or instore. Our ‘free postage over £50’ offer does not apply to gift vouchers, it does still apply to the goods bought with the voucher though.